Parking: At the northern end of the bay there is plenty of parking in the area around L’Etacq, either in front of the German bunker, which is used by Faulkner Fisheries or a couple of hundred metres further north close to Stinky Bay. Heading south along St Ouen’s Bay there are numerous car parks, which are used by surfers and walkers. At the southern end of the bay there is plenty of parking at La Pulente, drive down the small road and park as close as possible to the slip. There is also parking on the slip at Petit Port and in the car park at Corbiere, although launching isn’t always that easy. The great thing about the west coast is that all of the parking is free. Refreshments: As one of the main bays on the island there are numerous places to eat and drink. A few which are popular, from north to south, are Big Verns, the Watersplash, the Line Up, El Tico, Le Braye, the Hide Out and La Pulente Pub. Some only offer outside seating whilst others offer a full dining experience. Even in the winter there are a few places open for food and drink. On sunny summer evenings some of them are incredibly popular. This is not the section of Jersey’s coast, which immediately springs to mind when kayakers think about going for a paddle. 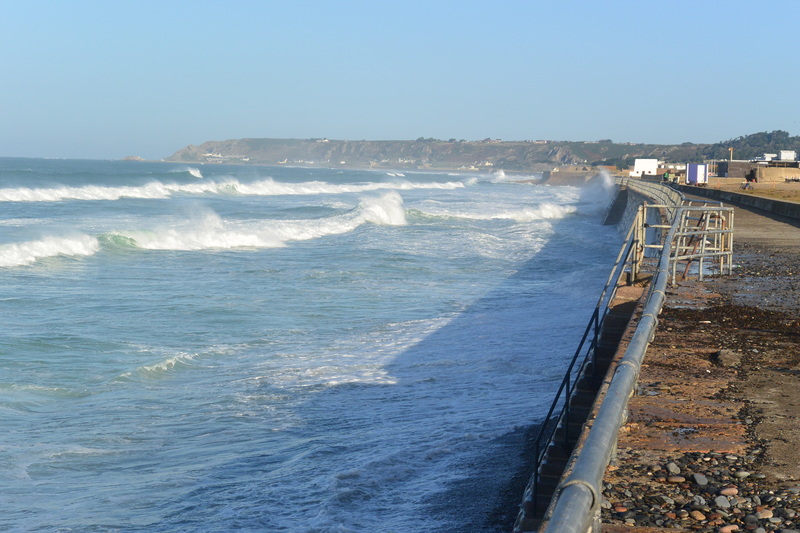 the west coast is dominated by the wide expanse of St Ouen’s Bay and the frequently present surf. The nearest land to the west is Newfoundland, so this stretch of coast is subject to the moods of the North Atlantic. Despite the sandy beach there are two sections of coast which can appeal to entertain sea kayakers. 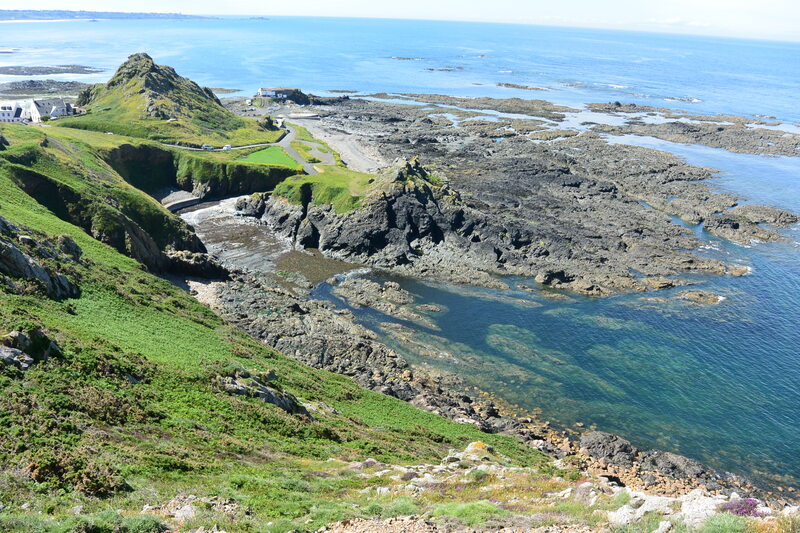 L’Etacq to Grosnez in the north and Le Braye to Corbiere in the south. This is in addition to obvious attractions, of the surf, for some paddlers. At the northern end of the bay the best place to launch is at L’Etacq. There are a couple of slips, close to the German bunker, which is used by a fisheries company. There is another slip slightly further north in the area known colloquially as Stinky Bay. Heading north from here takes you along what is arguably the most dramatic section of Jersey’s coastline. This has been described elsewhere. Due west from the slipways, are the offshore reefs of L’Etacq. As the gutters fill on the flooding tide there are some great channels to explore, with abundant bird life, particularly during the winter months. The area is exposed to any swell so it is best to select a day when the Atlantic is in one of her gentler moods. The area south from here is normally paddled as part of a longer trip, for example going around the Island. 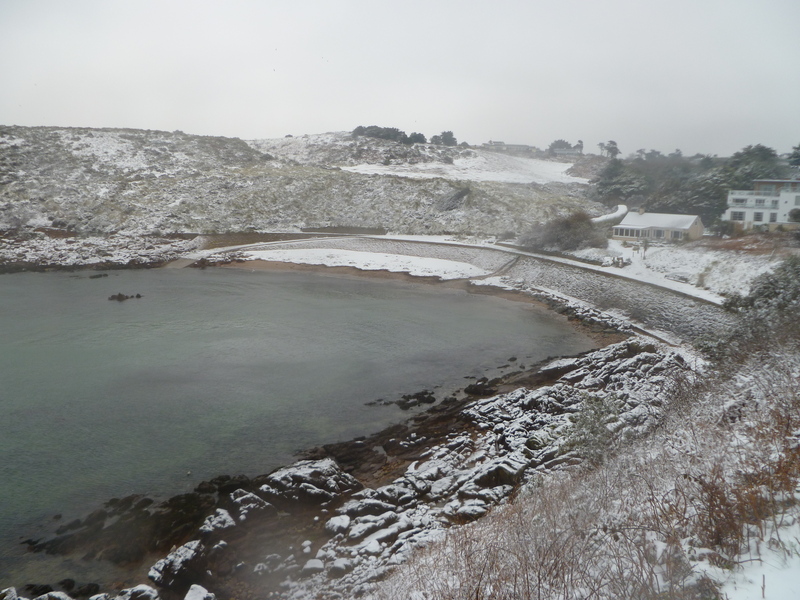 There is normally very little to look at, when compared to other areas of Jersey. Corbiere Lighthouse dominates the view to the south, whilst to the east, or your left, there is the sandy foreshore of St Ouen’s Bay. This is the principal surfing beach so there is frequently a westerly swell rolling towards the shore. 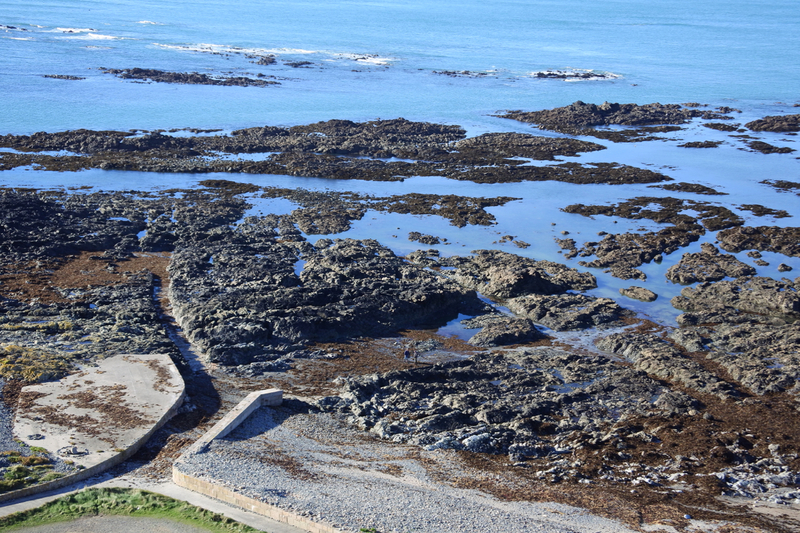 The sea wall of St Ouens Bay is part of the extensive German fortifications, which are found in this area. They saw the beach as being particularly vulnerable to invasion. In fact there have been several landings in this area in the past including by the Roundheads in 1651, when Jersey was Royalist, and in 1779 the Prince of Nassau attempted to land with a force of French soldiers near to what is now La Rocco Tower. Ahead lies La Rocco Tower. Built in the final years of the 18th century it suffered significant damage during the Second World War. In the early 1970’s there was a public appeal to raise funds for its restoration, which was successfully completed. In the last few years further restoration has taken place and it is available for rental for the night from Jersey Heritage, although there are strict weather and tidal controls. 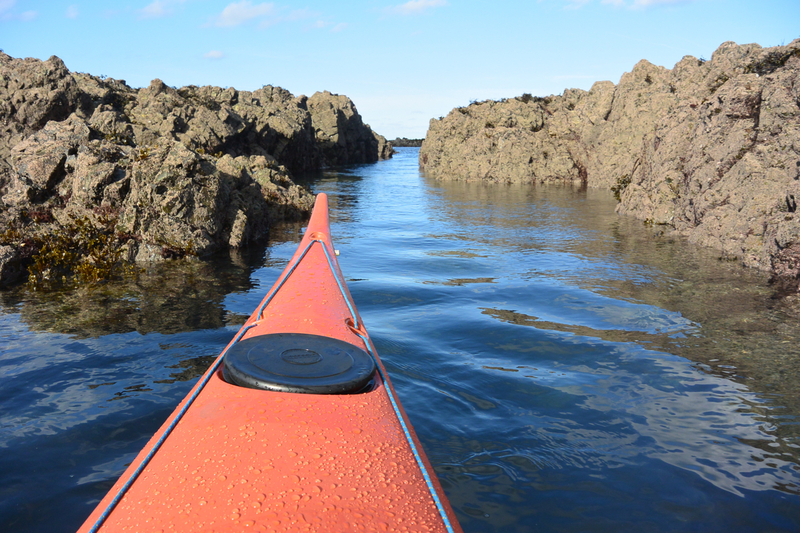 La Rocco marks the start of some more interesting paddling, winding your way through an extensive area of reefs, particularly towards low water, whilst having to avoid some significant swell at times. If there is any swell always keep a sharp eye to the west as larger swells can appear as if from thin air at times. From half tide upwards it is possible to launch from La Pulente. At certain stages of the tide a large area of relatively shallow water appears, which is fully exposed to any wind but protected from the swell. 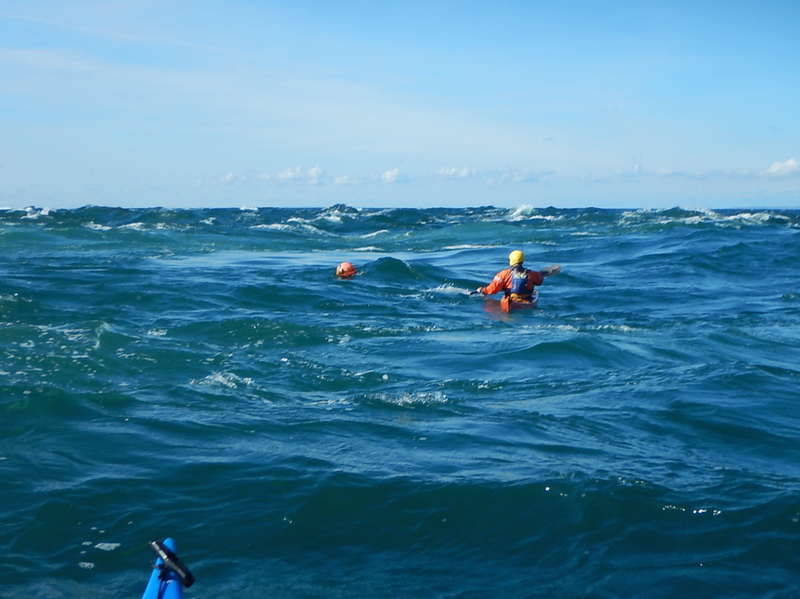 It is a great location to practice sea kayaking handling skills in high winds, and as long as the wind is from the west you are perfectly safe. We passed an enjoyable and at times demanding couple of hours one Sunday morning, when the wind rarely dropped below 40 knots. To the south is the small bay of Petit Port, from where it is possible to launch at certain stages of the tide, and there is some limited parking. If you do visit Petit Port make sure that you look at the stone work on the slipway, I think that that is is the most beautiful of all the slips on the island. Offshore and about 900 metres north of Corbiere is a reef, known as La Frouquie. On Monday 17th April 1995 the Channiland vessel “St Malo” was heading from St Helier to Sark with 307 passengers and crew on board when it struck the reef. Fortunately there were a number of other ships in the area at the time and a swift rescue was initiated. The vessel itself was towed to St Aubins Bay, with quite a considerable list, where it was beached and temporary repairs were made prior to it being transported back to France. When approach Corbiere it is sometimes necessary to exercise a bit of caution, as what it is possibly the most frequented reef break, by surfers, occurs close to the small headland just before Corbiere. The lighthouse sits offshore, although it is connected to the mainland by a causeway, over which the tide flows with surprising speed, particularly on the ebb of a spring tide. Corbiere Lighthouse is probably the most photographed location on the island. Summer sunsets and winter storms always attract a significant number of photographers. It was first lit in April 1874 and became automated in 1976. Close to the causeway, at Corbiere, a plaque commemorates the attempts of Peter Edwin Larbalestier, an assistant keeper of the lighthouse, who was drowned on 28 May 1946, while trying to rescue a visitor cut off by the incoming tide, who also lost her life. Many years ago I was landing on the slipway at Corbiere, after a Club session on a Thursday evening. I noticed the plaque and said to one of the people who was with us, “that’s funny you have the same name as the lighthouse keeper who drowned” his reply was “that’s not surprising he was my uncle and I am named after him”. In the Corbiere Phare Restaurant there is a photograph of Peter Edwin Larbalestier, in his lighthouse keepers uniform. The likeness to Peter Larbalestier is really quite amazing. Sadly Peter from the Jersey Canoe Club passed away a few years ago but every time we look at the photograph of his uncle we are reminded of the good times we had with Peter kayaking. Corbiere marks the end of our west coast sea kayaking. Either we will have had arrangements to leave the water here or we will turn onto the south coast and continue our journey towards St Brelade’s. Care needs to be exercised in the area of rocky reefs, which run west from L’Etacq and to the north of Corbiere, because of the possible swell. Remember that waves arrive in sets and so what appears to be relatively straight forward can quickly become extremely dangerous in this area. 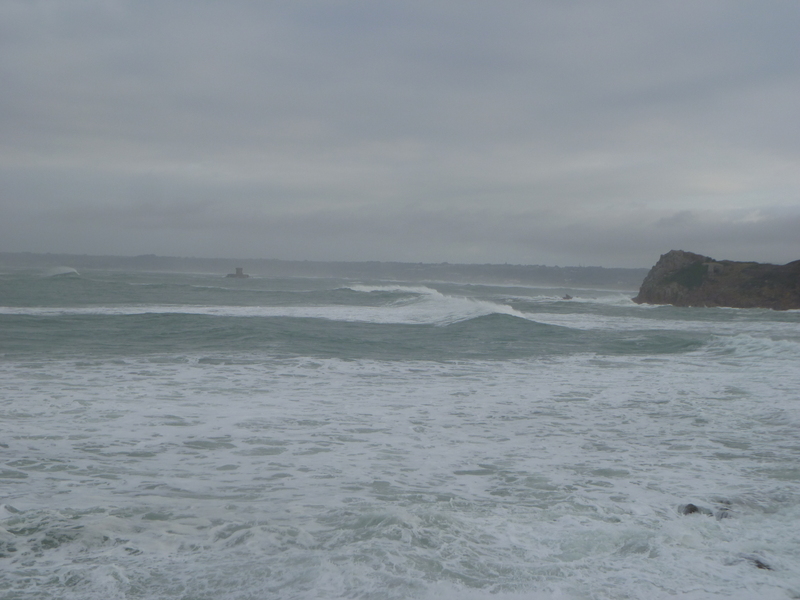 A strong tidal race occurs off Corbiere and at times near L’Etacq, especially just after high water on spring tides when the streams are running north. 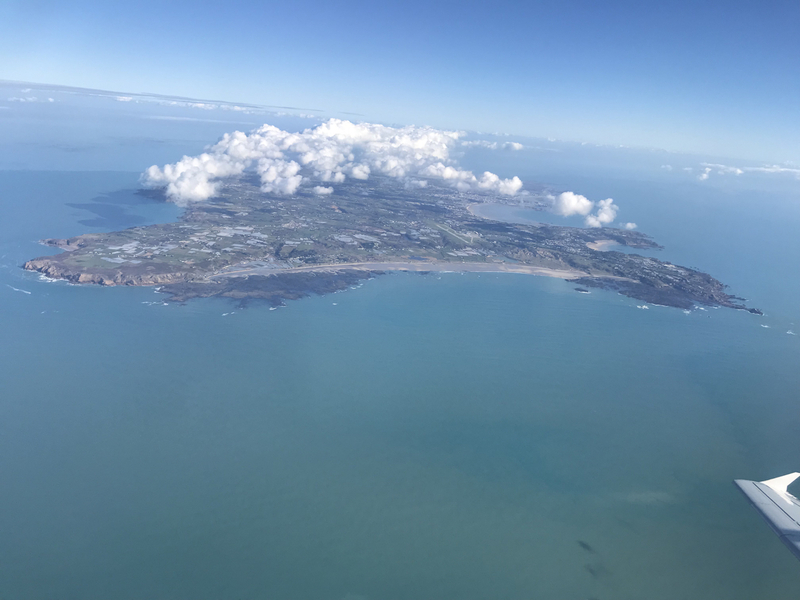 The whole of the west coast of Jersey seen just after take off from the airport. The view from the cliffs above L'Etacq never fails to impress. In the distance Corbiere can just be made out at the southern end of St Ouen's Bay. Looking north from Petit Port on a day with a considerable westerly swell rolling in. La Rocco Tower is visible in the distance. Spring high tide at St Ouen's. A beautiful day but launching and landing is not an option. Looking across the reefs at L'Etacq on a day with very little swell. Perfect for exploring the channels. One of numerous channels through the reef at L'Etacq. Approaching the tide race on the outside of Corbiere, on quite a lively day.